Why do car parks flood? 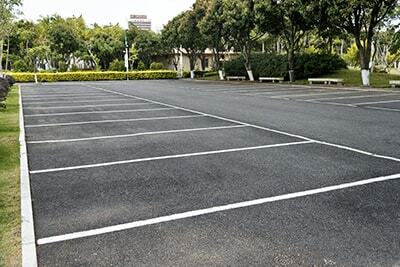 Typically car parks are covered with tarmac (or another equally hard surface) that is smooth and durable, but also impermeable, meaning heavy or prolonged rainfall can cause localised flooding and pooling if not managed correctly. Planning a car park, and how rain and storm water is managed, is vital to both protection from flooding and looking after the environment. Why can the surface of a car park be a problem? When you replace previously permeable land with a hard impermeable surface, and without replacement drainage that is equal to or greater than the evapotranspiration of the land that is now covered, rain or storm water falls unmanaged and can pool and create localised flooding. This can worsen further in areas attached to a large buildings; for example, a supermarket car park as storm water falls from the roof of the building and pools on the ground. These high volumes of water can make it dangerous for customers in vehicles as well as pedestrians. 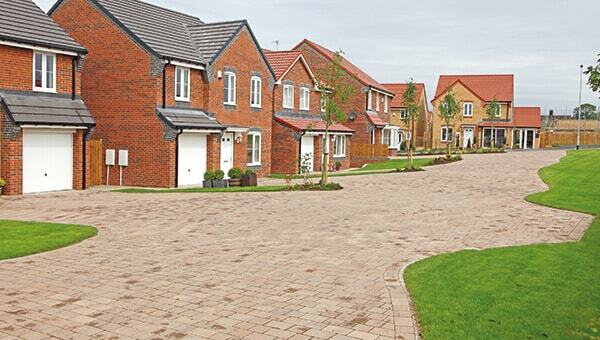 To help manage this excess water, channel drain can be installed to drain the water to a more suitable point. For a public parking area where many cars pass over all day you would need a robust and reliable channel drain to cope with the weight of the cars and the slow-moving load. The drain will need to have a C250 loading rating for this meaning it can withstand a 25 tonne weight. This is fine providing the usual vehicles which will pass over the grating are mainly standard cars and vans, not heavy lorries or forklifts etc. JDP recommends Hauraton RECYFIX® PLUS or Hauraton FASERFIX® for this application. Both are strong and durable channels with gratings that won't appear rusted or worn over time. RECYFIX® PLUS comes with a slotted ductile iron grating and a recycled PE-PP channel. FASERFIX® KS is a concrete channel base with a wide variety of composite or ductile iron gratings. 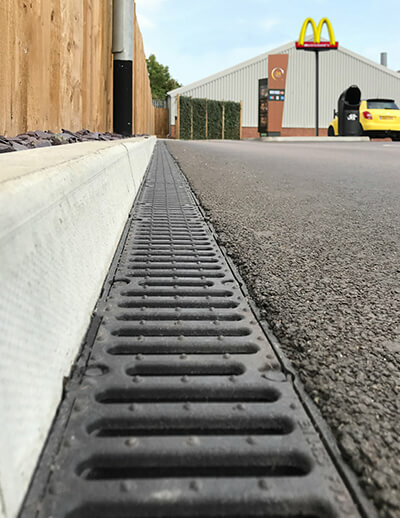 For parking and trafficked areas with heavier vehicles you would need a stronger channel drain just to be sure it will hold the weight of the vehicles and their loads - it is always best to use a drain capable of withstanding more weight than less! So, a channel drain with a D400 loading rating would be more suitable for this application where it can hold up to 40 tonnes. 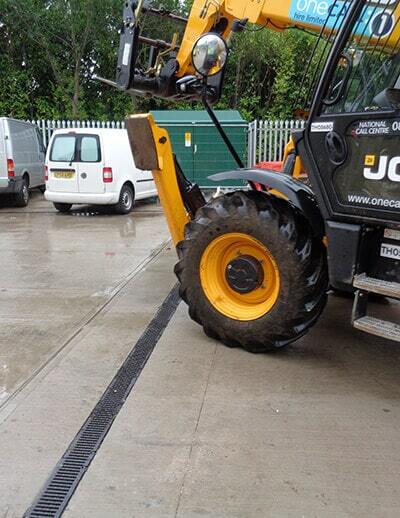 Consider using an E600 loading rated channel drain for areas using forklifts, such as warehouses and yards. 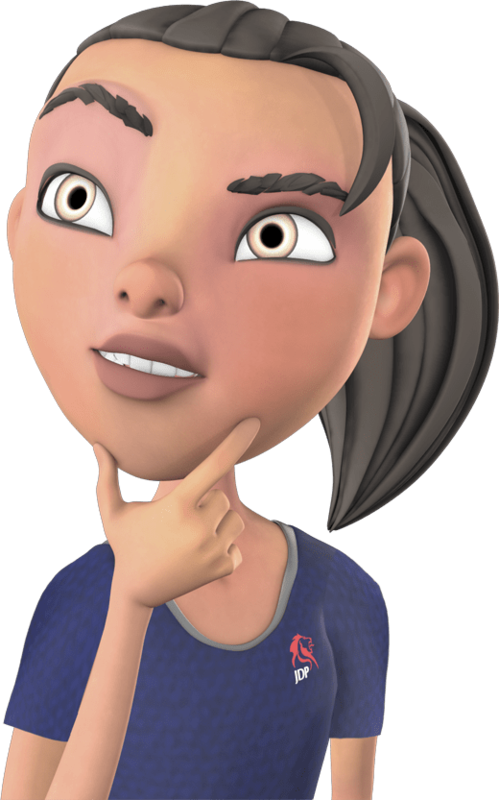 Consider Hauraton RECYFIX® NC or FASERFIX®. RECYFIX® NC is a modified polyproplene channel with slotted ductile iron grating. Slot width is 10mm. 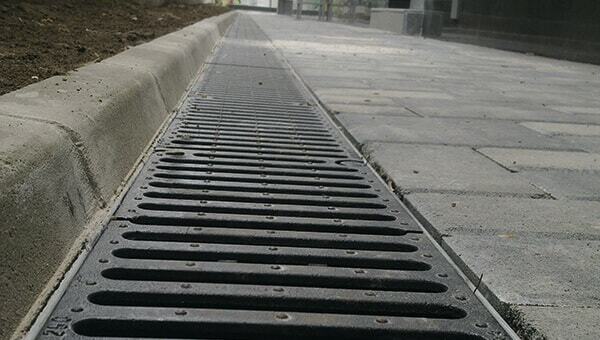 A 14mm slotted ductile iron grating. 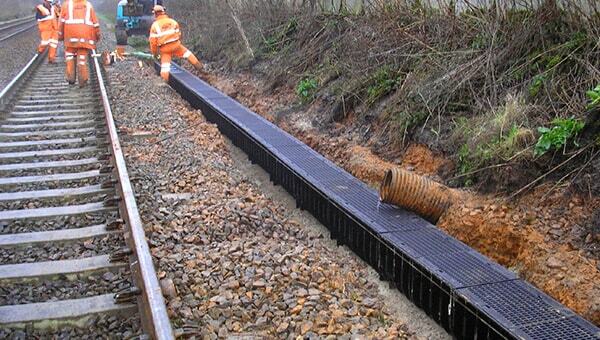 A 6mm heelsafe slotted ductile iron grating. A mesh galvanised grating with 11 x 30mm mesh size. A solid ductile iron grating that has no water collection capability, and is a cover grating for the channel. 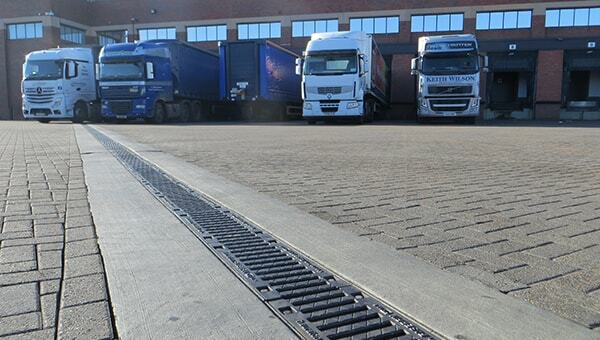 If you park aeroplanes or load cargo ships, even just at weekends, you'll need F900-rated channel drainage; The ever-versatile FASERFIX® KS is available with slotted ductile iron gratings. 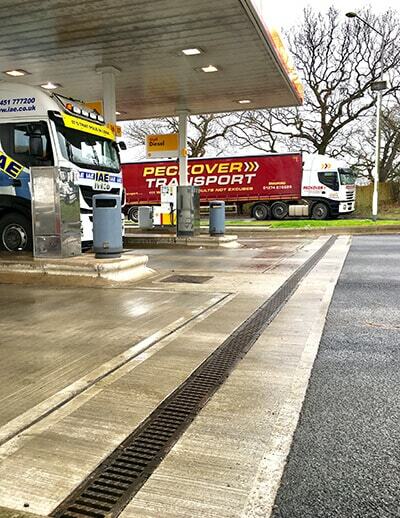 For petrol station forecourts channel drain is particularly useful as not only does it manage surface water it protects the forecourt from spills by removing petrol or diesel from the forecourt into the catch pit below ground. Certain specifications are often required for these applications and the products we stock easily meet the hydraulic requirements and capacities needed to cover any fuel tanker spillages. Channel Drain is popular in public areas as the flush grating prevents slipping and trip hazards. They require maintenance on a regular basis as a build-up of silt and debris is likely in these areas. To do this it is best practice to use a high-pressure water jet every so often and blast the lines clean.